"I know that you are guilty of the crime," stated the governor, "but I believe that you are truly sorry and will not do it again. Therefore, I hereby pardon you and release you to society on your honor. 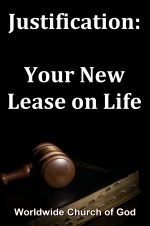 You now have a new lease on life." The words of this governor perfectly illustrate the Bible doctrine of justification. But how many Christians truly understand this subject? What about you? Do you understand justification? You must, if you are to enter God's Kingdom, for no one can be saved without being justified from sin! Justification is the process by which God forgives a person's sins by grace through faith. It implies not only forgiveness, but imputing to the person a positive state of righteousness in God's eyes. It is not earned through obedience, but requires repentance and keeping God's law. Some people don't have a clear idea in their minds about just what justification means because they confuse it with the related but separate subjects of faith, grace or law. Others believe that we are justified by works instead of faith. Some go to the opposite extreme and think that justification means that the law is done away. Some feel we are justified when we do nothing more than "profess Christ" or "believe on His name" in some public or private profession of belief. They may feel we don't need to be baptized or even repent in the true of the word. The best place to begin is with a simple definition. To justify means "to prove or pronounce one blameless of some wrong act,"
In everyday English parlance, we use the term to describe what people try to do when they are indeed guilty but wish to talk their way out of some trouble by denying their guilt. But in the Bible, justification is not what a person says about himself or herself, but what God Himself does for the person! To be justified, in Bible usage, means to be pronounced not guilty — not because one has not done wrong, but because one has been forgiven by God for the wrong done. For proof, read Romans 3:21-31, which shows that justification is the forgiveness of sin. See also Romans 5:9, which shows that justification is made possible by the shed blood of Christ. After our total spiritual cleansing by God, God views us as being righteous! As Romans 3:21-22 shows, this righteousness is not something we earn; rather, it is imputed to us when we are justified by faith. God forgives us totally and gives us His own Spirit of righteousness. Romans 4:1-8 says God imputed — that is, credited — Abraham with righteousness because of Abraham's faith, which resulted in his justification. Abraham had not earned such favor. But God imputed righteousness to him after forgiving his sins, because Abraham had faith. But forgiveness of sin coupled with a pronouncement of righteousness — justification — does not come automatically. It has conditions. And here is where many jump the track. For one thing, man cannot justify himself. It is something God must do. Jesus upbraided the Pharisees because they sought to justify themselves before others (Luke 16:15). Certainly, people cannot justify themselves with verbal pronouncements of innocence, for they are not innocent. "All have sinned and fall short of the glory of God," says Romans 3:22. The Pharisee in the parable of the publican and the Pharisee (Luke 18:9-14) tried this approach. He listed all the good he had done, in the hope that God would see his righteousness. But Christ said that the publican, not the Pharisee, went down to his house justified. The publican truly repented of his sins, and God imputed His own righteousness to him. Romans 4:1-8 states that Abraham was not justified by works but by faith. Romans 3:20 proclaims that "by the deeds of the law no flesh will be justified in His sight." Verse 28 says, "a man is justified by faith apart from the deeds of the law." Galatians 3:11 confirms that, "no one is justified by the law," and Galatians 2:16 repeats that "a man is not justified by the works of the law." But do not misunderstand! These verses do not mean that we need not keep the law. More on this later. For now, however, notice plainly that one cannot earn justification by anything he or she alone says or does. How, then, can we be justified? How can we find forgiveness and have God's righteousness imputed to us? First, we must realize that it all happens by God's grace. We are, as Romans 3:24 says, "justified freely by His grace." Grace is simply unmerited favor. To be justified by grace therefore means that justification is a gift that God gives — not something we earn. It is given because of God's goodness, not ours. Second, justification is through faith. Acts 13:39 says those who "believe" — those who have faith — are justified. Romans 3:26 concurs that God is the justifier of "one who has faith in Jesus." See also Galatians 3:8, 24. Faith is belief that God exists and that He will do what He says He will (Hebrews 11:6). When God calls a person and grants the person a gift of repentance (Romans2:4), He extends forgiveness to the person when he or she turns from sin and begins to obey God. Hence justification involves grace and faith. As Ephesians 2:8 says, it is by grace through faith. It is because of God's favor and not our own goodness, but faith is a necessary condition. But even this faith is not something the person alone supplies. True faith is a gift from God. It is not found naturally in any person (Galatians 5:22). Yet it requires a person's cooperation. Here is how it works: When God decides to call a person, that person at first responds to God with only human belief. But it is belief backed by action. As James 2:26 says, "Faith without works is dead." The first action is repentance — the act of ceasing to sin and changing one's whole life to obey God in everything God commands. The next step is baptism, which follows after belief and repentance (Acts 2:38). It is only at baptism that one's sins are finally forgiven. It is only then that we are justified and our sins are covered by Christ's shed blood and death (Romans 5:9). As a result of baptism and the laying on of hands by one of God's ministers, we receive God's Spirit and are filled with true faith. Thus the process starts with human belief but leads to Christ's own faith being placed in us. But why does God justify only those with faith — belief that causes them to act? The answer is that one who truly believes God only disobeys out of weakness of the flesh and the pulls of Satan. He does not intend to disobey. He constantly strives to obey God, with God's help. He lives under God's grace, and God continues to justify him and impute righteousness to him. A person without faith thinks he knows better than God. He wants to follow his own way. He intends to and will disobey God. Faith is the difference! Therefore God requires faith — trust in Him — to justify us. But one final piece must be put into the justification puzzle at this point. Many believe that once you are justified, you need not keep God's law. But to say we are not justified by the law (which is true) is something totally different from saying that we don't need to keep the law (which is false). Romans 2:13 makes this truth plain: "For not the hearers of the law are just in the sight of God, but the doers of the law will be justified." What could be plainer? And Romans 3:31 adds, "Do we then make void the law through faith? Certainly not! On the contrary, we establish the Law." You will not be saved because your obedience earns it, but your disobedience can and will disqualify you. Romans 3:21-31 — all have sinned and need to be justified; justification includes the forgiveness of sin. Romans 4:3 — justification also includes the imputing of righteousness. Romans 5:9 — justification is made possible by Christ's sacrifice. Luke 16:15 — we cannot justify ourselves. Romans 4:1-8, Galatians 2:16, 3:11 — we are not justified by the law or works. Ephesians 2:8 — we are justified by God's grace through faith. Romans 2:13, 3:31 James 2:14-26 — works and law keeping are both necessary, although they don't justify us. God's forgiveness of our sins and imputing of righteousness to us is a wonderful blessing, made possible by the sacrifice of Jesus Christ. And once justified by God, we, just like a criminal pardoned for his crime, can begin again with a brand-new lease on life.